Each year, the Peace Corps ranks top volunteer-producing colleges and universities according to the size of their student bodies. With 36 alumni currently volunteering, W&M is ranked fourth among medium schools (5,000-15,000 undergraduates) in the 2017 Top Volunteer-Producing Colleges and Universities list. Last year, the university was 10th on the list with 24 alumni serving as volunteers. Since the Peace Corps began in 1961, 645 alumni from W&M have volunteered with the organization, including Casey Douma ’16, a community heath volunteer currently working in Cameroon. A map showing where W&M alumni are currently serving is available online. 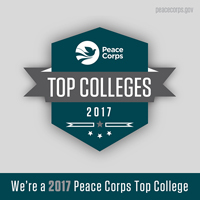 In addition to W&M, three other Virginia schools were included in the Peace Corps' rankings this year. The University of Virginia and James Madison University were 15th and 17th respectively among large schools with more than 15,000 undergraduates. The University of Mary Washington was second on the list of small schools with less than 5,000 undergraduates. American University, which has 54 current volunteers, took the top spot on the list of medium colleges and universities. The University of Wisconsin-Madison (87 volunteers) topped the large colleges and universities list, and Denison University (16 volunteers) was number one on the list of small schools. The rankings are based on fiscal year 2016 data as of Sept. 30, 2016, as reported by Peace Corps volunteers, according to the press release. More than 225,000 Americans have served in 141 countries worldwide with the Peace Corps since its founding.